Ah, novelty sweets – not so much about the candy but the plastic/colorized/motorized container it’s in. From the ever illustrious Ring Pop to the classic Batman spin pop (because what’s more intimidating that the Dark Knight with a giant pink lollipop whirling around above his head), you’re essentially paying for the packaging over the pop. Hence, I had no qualms over dropped 50 cents on a set of suckers that are literally supported by a plastic tube filled with glowing chemicals. “Snap-N-Glow Pops” is a bit of a misnomer. It’s not the pop that glows, just the stick. And it’s not just that: they’re dim and hard to crack as well. 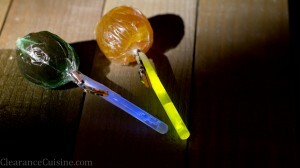 But thanks to Koko’s Confectionery & Novelty (A Division of A & A Global Industries), we now have a product that can serve as both a candy and a disaster preparedness item and/or accessory at an all-night rave. In a drastic turn from my usual gluttonous style, I didn’t finished eating this product; I didn’t even go past two licks. The hard (yet oddly squishy) had almost fused entirely with their outer plastic wrap and after dealing with that, I was left with an old, outdated sucker that reminded me a lot of those that you purchase from an obnoxious kid through a school fundraising effort. Neither the blue raspberry nor lemon had any outstanding qualities other than being terrible. Guess I’m just a sucker for disappointment. This entry was posted on Thursday, April 5th, 2012 at 8:00 am	and is filed under Food. You can follow any comments to this entry through the RSS 2.0 feed. Both comments and pings are currently closed.